Channeling my inner summertime was very easy yesterday. I ate lunch outside sitting in sunny 52° weather, completely atypical of December 3rd in any other year of my life. And with China Glaze Sunshine Pop and Naild'It Summer Lovin' Melon on my tips, it still doesn't feel like winter at all. This was my first time using Sunshine Pop. It is a bright yellow with silver-white shimmer. Basically China Glaze Happy-Go-Lucky with a slight frost. The bright yellow isn't the kindest to my skintone but I love it anyway! My first coat of Sunshine Pop was was a thick, streaky mess. It had issues with bubbling and I was almost ready to call it quits right there. I kept my wits about me, dropped some polish thinner into the bottle, shook it again, and was able to continue without bubbles, fortunately. It still took two more coats to be decently opaque, and then it had more frosty brushstrokes than I liked. I immediately followed with my fast drying topcoat and that evened it out wonderfully. In the end I love it! What do you think? It isn't the best formula I've had to work with, but I think it is worth the three coats. Topcoat made all the difference in my attitude going from "meh, it's so-so" to "wow, candy-colored-sunny-bright-goodness!" And I knew it would also be a protective barrier between the glitter that was about to go over top. 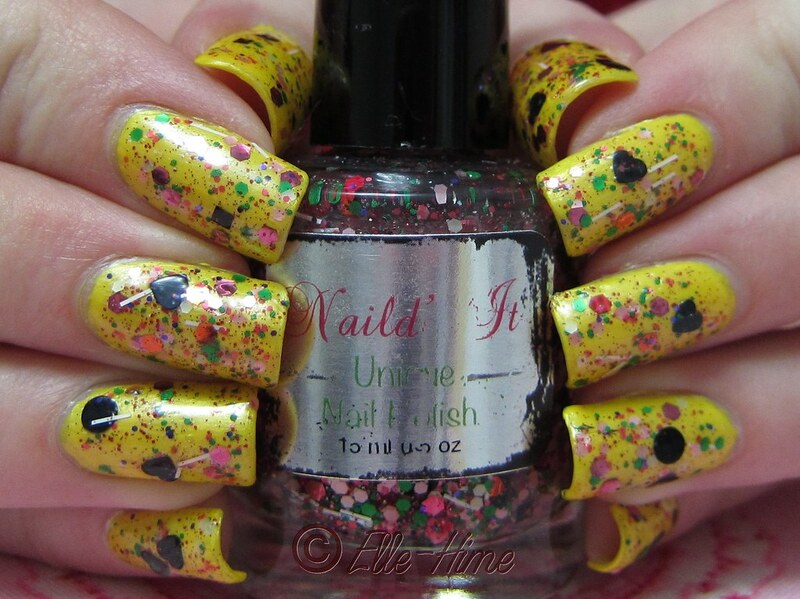 I was fortunate to win a bottle of Naild'It polish from Kim at OverallBeauty. She offered it as a prize in a water marble contest. 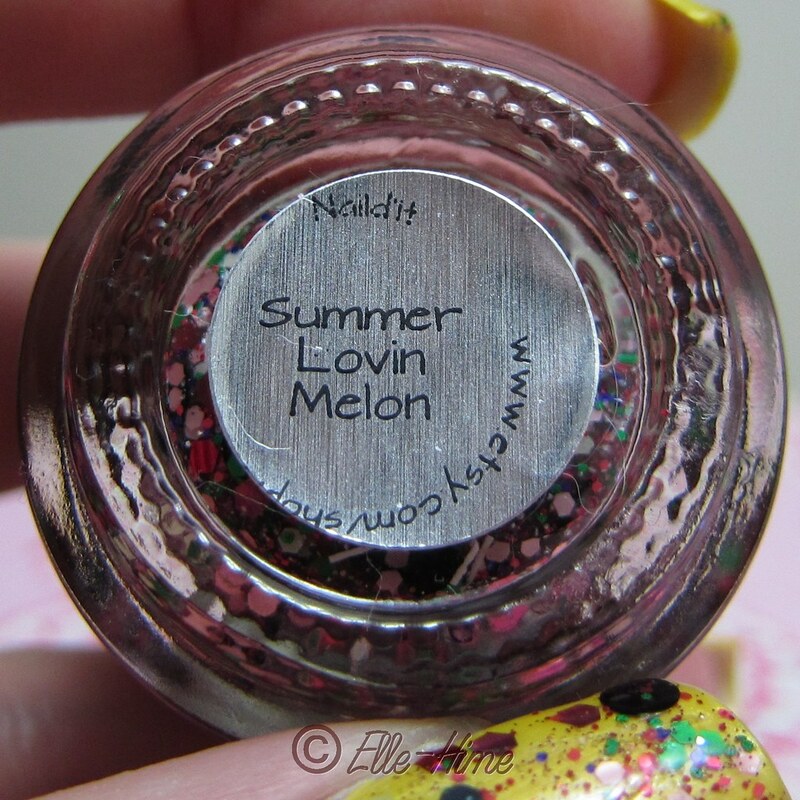 Summer Lovin' Melon is my first bottle from the brand. It is full size (15ml) and has silver printed labels, but some words aren't easy to read. I really like the sturdy bottle shape, but at first the stubby handle looked goofy to me. The brush and handle are perfectly good, though. Now I love how the handle is flat on top. All I had to do was turn the bottle upside down (I think I left it for a half hour?) before using it and I had no issues getting the glitter out! In fact, a lot of times I was wiping glitter back in. The formula is very thick. This helps the glitters not to slide around when applied but you do need to watch out for brush overload! Looking at the bottle it can be hard to tell what is hiding in there. I didn't realize that it includes black circle glitter until one came out on my brush, and then another, and another! I used two coats of Summer Lovin' Melon, but would be happy with one, as well. 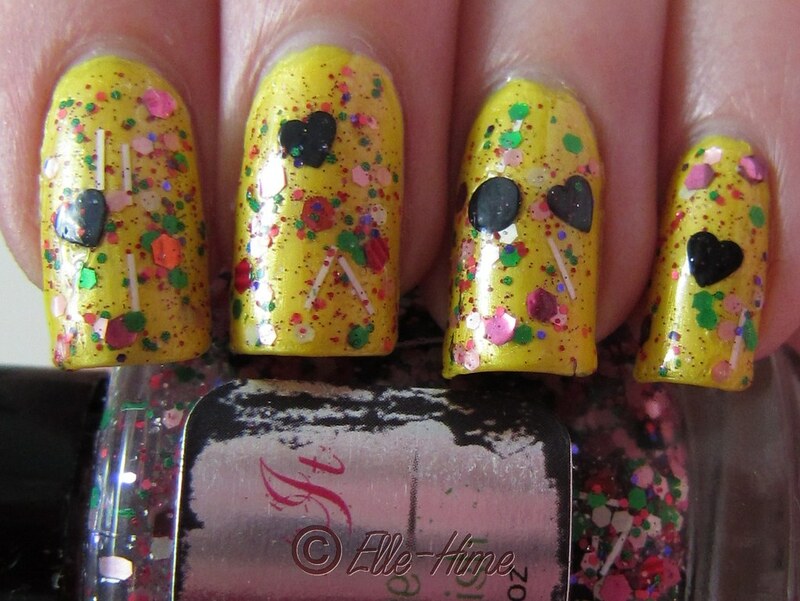 The glitter is easy to apply and only needs dabbing to cover thin spots. The large black hearts and circles were often on the brush without me realizing. There are black squares as well, but these seem more sparse in the formula. The other colors are large pink and orange hexes, white bars, striped matte red hexes, satin green, purple, light pink and white hexes. Microglitter comes in red, too. I chose a yellow base to show everything off, but next time I'll try a watermelon pink to get it's namesake look. I had to photograph both of my hands to show how colorfully my nails turned out. 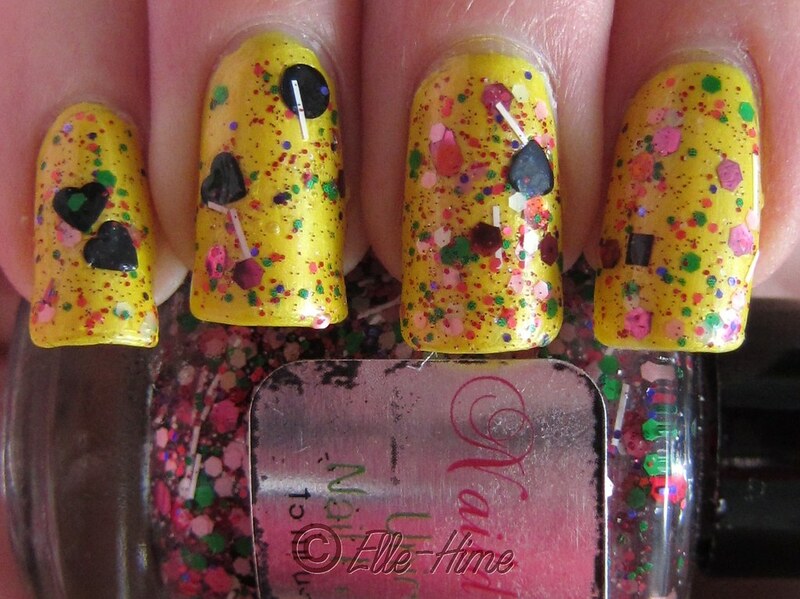 Yes, this is a chaotic polish, but it is fun and eye-catching. I just wish I would have had sunshine when it came time to do these pictures! In the end I have been pleasantly surprised by this busy glitter polish. Judging by other swatches Online I thought it would apply as small glitter with a stray heart here or there, but that wasn't the case. It was easy to work with, and is my first polish to contain those awesome circles. Right now the Naild'it etsy shop is closed, but you can buy these from various indie polish e-tailers. They go for about $10-$11 from what I've seen. Honestly that is steep for me so I'll probably hold off on these unless I really love the color. This means that you can get financing from Cash Converters even if you've got extremely a low credit score rating as well as a small level of income Payday Loans also, defaulting on your own loan could cause more credit problems later.